attend Walk In Interview at given Venue for engagement of Medical Officer (MO), GNM/Staff Nurse, Para medical Worker, Physiotherapist, Hospital Attendant, Sanitary Attendant, Para Medical Worker, Physiotherapist etc purely on contract basis only. Last date for submission application form for this DHFWS bankura district recruitment is 11-12-2017. Walk in interview or documents verification dates details for shortlisted candidates will be informed later. Application form is available for download in www.bankura.nic.in and wbhealth.gov.in websites only. CMOH Bankura will conduct a test or Interview to select candidates for MO, GNM etc Jobs. 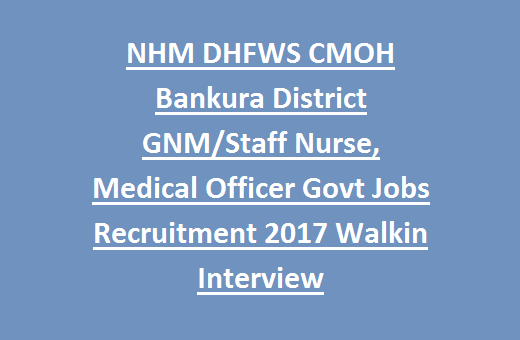 All details of DHFWS CMOH Bankura District Recruitment for 54 GNM/Staff Nurse, Medical Officer Jobs mentioned below. 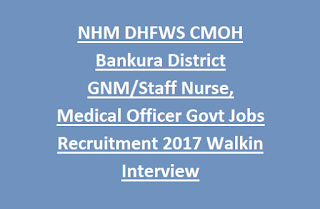 Last date for submission of application form for this CMOH Bankura Recruitment is 11-12-2017. As per CMOH Bankura Recruitment 2017, total Available Vacancies are 54. MBBS degree recognized by MCI for MO Jobs; MA/ M.Sc. in sociology or Applied psychology is the Qualification for Counselor Jobs; Bachelors in Physiotherapy for Physiotherapist Jobs; GNM Course recognized by INC is the Qualification for GNM/Staff Nurse Jobs. Please refer Official Notice for more details. Up to 63 years for MO Jobs; Up to 40 years for Counselor, Physiotherapist, Hospital Attendant, Sanitary Attendant, Para medical, GNM/Staff Nurse Jobs as on the date of Walk In Interview process. 1. Rs.40,000/- per month for MO (Medical Officer) NHM, Thalassaemia Jobs. 2. Rs.16,860/- per month for GNM (Thalassaemia), Counselor (Thalassaemia), GNM (NRC) Jobs. 3. Rs.20,000/- per month for Physiotherapist Jobs. 4. Rs.7500/- for Hospital Attendant, Sanitary Attendant Jobs. CMOH Bankura will conduct a test or Interview to select candidates for MO, GNM etc Jobs. Application Fee is Rs.100/- for UR category candidates; Rs.50/- for SC, ST category candidates through demand draft (DD) drawn from any nationalized bank in favour of 'district Health & Family Samiti Bankura A/C construction' payable at Bankura. DD to be attached with application form. Eligible and interested candidates fulfilling all requirements have to appear before the Recruitment committee for Walk In Interview at below Venue for engagement of GNM, MO etc Vacancies along with duly filled Application form, self attested copies of Qualification, age, experience, demand draft (DD) etc.